The news tonight from New Zealand's north island is terrible. Eleven people, 10 passengers and a pilot killed in a fiery hot air balloon crash. Apparently the airship flew into a power line and caught fire. Early reports suggest the balloon was 160 feet above the town of Carterton, east of the capital city of Wellington. Even those able to get out of the burning basket could not survive the fall. The news had a particular impact on me. 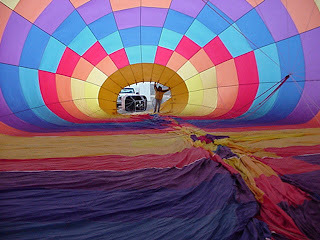 Last autumn I spent two idyllic days at the Plano Balloon Festival in Texas. High winds made it impossible for me to actually get up in the air, nevertheless I was enchanted by the sight and sound of them. But the news from New Zealand also reminded me of a tragedy in Canada on August 24, 2007. 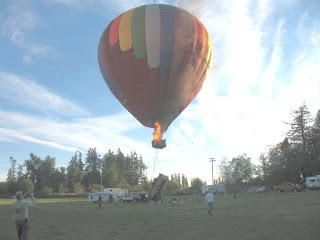 At a balloon festival in British Columbia that summer there were 12 passengers and the pilot in the basket waiting to lift off but the aircraft was still tied to the ground when fire broke out. All but two of those on board were able to get out of the basket on the pilot's order, but the fire severed the ground tether before the last two, a mother and her daughter, could flee. The balloon rose with the two women still inside and they were killed. It was the second serious balloon accident in a month in Canada and when the Transport Safety Board issued its final report, it included a call for a wide-ranging safety review of hot air balloon operations. There is a triad of incompatible elements in hot air ballooning, fire and air being two of them, altitude being the third as the accident in New Zealand seems to show. 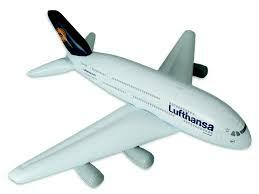 Reports say this is the most deadly aviation accident in the country since a DC-10 crash that killed 257 in 1979. But near-record breaking or not, I have every confidence the air safety investigators at the Civil Aviation Authority of New Zealand will do their conscientious best to find out what happened. They may discover, as I did while researching the Canada balloon accidents, that over the past two and a half decades there have been more than 500 hot air balloon accidents - about a tenth of them involving fatalities. These deaths come in ones and twos for the most part. Though there have been exceptions. Six people died in 1993 in Woody Creek, Colorado. Four were killed three years earlier in Ohio. Both accidents involved the balloon striking something. Power line strikes are a factor in one out of three balloon accidents and more significantly, when a power line is involved the event is twice as likely to cause fatalities and serious injuries. That's because the current being carried on power lines can ignite the balloon. Even when electricity is not a problem, high tension lines can slice through a fast moving airship - instantly deflating the envelope and sending the basket plummeting. Fire, air and altitude, are inherent in the sport of hot air ballooning but when you look at the accident statistics too often power lines are a disturbing constant as well. There is nothing more devastating than fire in an aircraft - any aircraft, whether balloon or airship or helicopter or airplane. And sadly, there is a steady drumbeat of these mishaps. When I was in the shipbuilding business, the arch reminder was always, "A fire at sea can ruin your whole day." In the air, it's so much worse. I wrote a bit on the topic a while ago, here. I don't think we can make our aircraft safe from fire so long as we use inflammable materials of construction and carry chemical fuels. But we have to look long and hard at these awful accidents and resolve to take the risks associated with fire in the sky terribly seriously. Have a safe New Year, Chris.